Of all the topics in the Word of God that Jesus taught about, He had more to say about the topic of The Kingdom than pretty much any other topic. If it was as important to Him to teach so often about it then it ought to be important to us as well! The Kingdom is mentioned and taught about many times throughout the Gospels as well as other parts of the New Testament. The kingdom of God is synonymous with the kingdom of heaven and Jesus taught that we should have a Kingdom perspective and keep The Kingdom in mind in all we do. 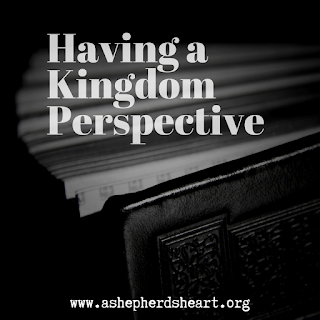 So what is The Kingdom and What is a kingdom perspective and How do you and I keep a kingdom perspective? The aim of this communication is to briefly touch on these topics in order to wet your appetite for your further study about this. 1- God’s Reign over the universe. 2- God’s Spiritual Reign over those whose hearts are His. If you are born again, you are a part of God’s Kingdom. The kingdom of God is a spiritual rule over the hearts and lives of those who willingly submit to God’s authority. 3- God’s millennial reign mentioned in The Book of Revelation. 4- God’s reign in heaven. "Therefore let us be grateful for receiving a kingdom that cannot be shaken, and thus let us offer to God acceptable worship, with reverence and awe, 29 for our God is a consuming fire." The kingdom of this world is and will be shaken as it is temporal, but, God’s kingdom is eternal and will NEVER be shaken! “Not everyone who says to me, ‘Lord, Lord,’ will enter the kingdom of heaven, but the one who does the will of my Father who is in heaven." There will be and are fakers in the church today and God knows who they are. They will not enter the kingdom of heaven and are not part of it now as they haven't received His free gift and are just going through the motions. Why do I say that? The fruit of their lives is evidence that He is not The King of their life. Furthermore, while they may have intellectually acknowledged His existence, they haven’t really come to the end of themselves and allowed Him to fully reign. Also, in order for the Holy Spirit to be able to do His work, Jesus has to be the King of their / our heart, the King of their / our lives. If you are in Christ, you’re a part of His kingdom and as you do His will you see a glimpse of His kingdom now because He reigns over you and as your King, you seek to glorify Him and it’s really practice for heaven…because when you’re in His presence it’s going be all about Him! If you read passages like Luke 11:2-4 (ESV) and Matthew 6 and many other passages you'll see that He always kept God's Kingdom at the forefront. When the disciples ask Jesus to teach them how to pray, He taught them from the very beginning it’s about being focused on His Kingdom and Will. Why? Because it matters now (the present Kingdom) and in Heaven (The Future and Eternal Kingdom). It’s all about His Kingdom and Jesus reminds us that we’re building His kingdom, THE KINGDOM, not our own little kingdoms. Furthermore, He reminds us in Luke 12:29-32 that we are to seek His Kingdom and we're not to worry about things like food, shelter, and other temporal things because He is your provider. He will take care of you and I! In a very practical sense, if you’re focused on His Kingdom and will, would you and I really have any time to focus on worrying? Absolutely Not! With our natural inclinations it’s easy to worry, but, if you’re in Christ, you are no longer just a natural man or woman.You’re a child of the One True King who cares about every aspect of your life and will always provide exactly what you need. 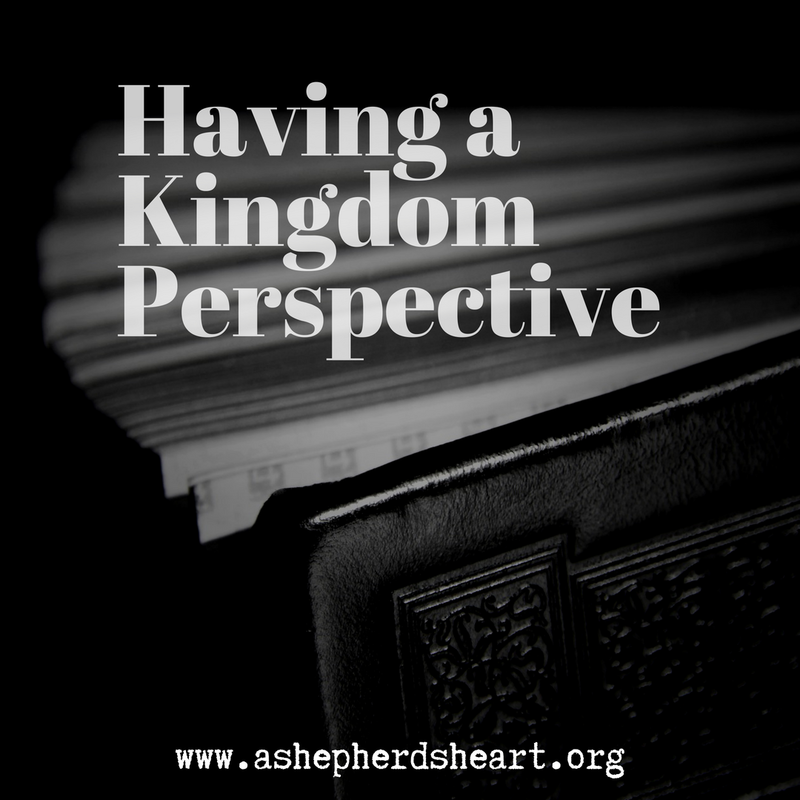 How do you and I keep a Kingdom Perspective? If you are in Christ, You have been raised from the dead and given a new life that you’re to walk in as you've become part of The Kingdom as Christ reigns in and through you! And…He has secured your entry into the eternal Kingdom which is heaven. It continues as you keep your mind on and actively seek the things above. Seek God the Father, Seek Jesus, Seek the Holy Spirit! Again, set your mind on the things above…not the things of earth. It’s a transformation of your mind and the mindset you have. You focus on His Kingdom not the kingdom of this world. The more you abide in His Word through regularly reading and study it, the more you grow to understand His Kingdom purposes and have a clearer Kingdom perspective. As one who is redeemed, a Kingdom Perspective helps you view world events with Kingdom in mind and helps you make decisions with a Kingdom perspective. It's not only about the future kingdom but it’s also about experiencing a glimpse of the Kingdom now by always keeping His kingdom and glory I mind as you seek to do His will. Again, everything you and I do needs to be done and viewed through the lens of scripture and with His Kingdom and Glory in mind. If you've been on this journey with me for a while, you've heard me often say that God's Word is the lens by which we see and know the truth. As we abide in and live out His Word, we'll have clearer vision because He will help transform and renew our minds so we can view everything from His lens including seeing, having, and keeping a Kingdom Perspective. Our lives, everything that is within us if for His Kingdom and glory! Do you want clear vision? Then have a kingdom perspective! Will you say and pray as Jesus taught, Your Kingdom Come, Your will be done, on earth as it is in heaven or not? We need to remember that a life that is yielded to Him and abides with Him and in His Word, is a life He can and will use for His kingdom and glory. The question is, will you let Him work in and through you for His Kingdom and glory? And in all things, will you live with and keep a kingdom perspective? If you really want serve Him and see all things through His lens, strive each day to keep a kingdom perspective. Keep Jesus and God's Kingdom at the forefront of all you do! I pray that you will! P.S. There are many aspects of The Kingdom that Jesus and other's taught about in the New Testament and I want to encourage you to do a word search / study sometime of the New Testament for the key world “Kingdom” and you’ll see how much Jesus taught about this topic.